As now many of us are using windows 8, today i will provide you collection of windows 8 shortcut keys, which will make windows 8 more easy and user friendly to you. Windows+D : Access the Desktop. Windows+C : Show the Charms. Windows+Z : Show the App Bar while in any app. Windows+Tab or Alt+Tab : Cycle through open apps. Windows+period : Snap an app to one side of the screen : . Right Shift key : If you press it for eight seconds, it turns on Filter Keys. If you press it five times in a row, it turns on Sticky Keys. Ctrl+mouse wheel : When used on the desktop, it changes the size of your desktop icons. When used on the Start screen, it zooms in and out. Win+C : Open the charms. Win+D : Show the desktop. Alt +D : Select the address bar in Internet Explorer. Ctrl+Alt +D : Enable the Docked mode in the Magnifier tool. Win+E : Open File Explorer. Ctrl+E : Select the search box in File Explorer. Win+F : Show Files in the Search charm. Win+Ctrl+F : Open the Find Computers window, which can find computers on a network (used mostly in business networks). Win+G : Cycle through desktop gadgets. Win+H : Open the Share charm. Win+I : Open the Settings charm. Ctrl+Alt +I : Invert colors in the Magnifier tool. Win+J : Switch the focus between snapped apps and larger apps. Win+K : Open the Devices charm. Win+L : Lock the computer and display the Lock screen. Ctrl+Alt +L : Enable Lens mode in the Magnifier tool. Win+M : Minimize all the windows on the desktop. Ctrl+N : Open a new File Explorer window. Ctrl+Shift +N : Create a new folder in File Explorer. Win+O : Change the Lock screen orientation. Win+P : Open the project options for a second screen. Win+Q : Open the Search charm. Win+R : Open the Run window. Win+T : Set the focus on the taskbar and cycle through the running desktop apps. Win+U : Launch the Ease of Access Center. Win+V : Cycle through notifications. Win+Shift +V : Cycle through notifications in backward order. Win+W : Open Settings in the search charm. Ctrl+W : Close the current window. It works only in desktop apps. Win+X : Open the hidden system menu. Win+Z : Opens the app bar. It works only in Windows 8 apps. Win+keys from 1 to 9 : Display the app at the given position on the taskbar. Win++ (plus sign) : Zoom in while using the Magnifier tool. Win+- (minus sign) : Zoom out while using the Magnifier tool. Win +, (comma) : Peek at the desktop. Win+. (period) : Snap a Windows 8 app to the right. Win+Shift +. 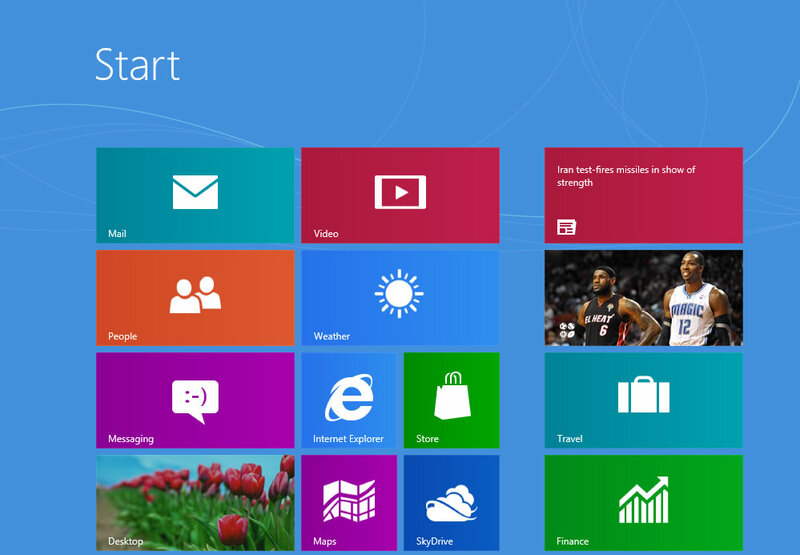 (period) : Snap a Windows 8 app to the left. Win+Alt +Enter : Launch Windows Media Center if installed. Alt + Enter : Open the Properties window for the item selected in File Explorer. Space : Select or clear an active check box. Win+Space : Switch the input language and keyboard layout. Alt +Space : Open a shortcut menu in desktop applications. Tab : Move forward through options. Win+Tab : Cycle through Windows 8 app history. Win+Ctrl+Tab+Arrow keys : Cycle through Windows 8 app history in the direction you specify by using the arrow keys. Ctrl+Tab : Cycle through Windows 8 app history (identical to Win+Tab). Alt +Tab : Switch between opened apps (including desktop apps). Shift +Tab : Move backward through options. Ctrl+Alt +Tab+Arrow keys : Switch between opened apps (including desktop apps) in the direction you specify by using the arrow keys. Win+Esc : Exit the Magnifier tool. Ctrl+Esc : Show the Start screen. Ctrl+Shift +Esc : Launch Task Manager. PrtScn : Copy an image of your screen to the Clipboard. Left Alt +Left Shift +PrtScn : Turn on High Contrast. NumLock : Press for five seconds to turn on Toggle Keys. Ctrl+Insert : Copy (alternative to Ctrl+C). Shift +Insert : Paste (alternative to Ctrl+V). Win+Home : Minimize inactive desktop windows. Win+PageUp : Move the Start screen to the left monitor. Win+PageDown : Move the Start screen to the right monitor. Win+Break : Open the System Properties window. Left arrow : Open the previous menu or close the current submenu. Win+Left arrow : Snap the active desktop window to the left. Win+Shift +Left arrow : Snap the active desktop window to the left monitor. Ctrl+Left arrow : Show the previous word or element. Alt +Left arrow : Show the previous folder in File Explorer. Ctrl+Shift +Left arrow : Select a block of text from the current cursor position to the left. Right arrow : Open the next menu or submenu. Win+Right arrow : Snap the active desktop window to the right. Win+Shift +Right arrow : Snap the active desktop window to the right monitor. Ctrl+Right arrow : Show the next word or element. Ctrl+Shift +Right arrow : Select a block of text from the current cursor position to the right. Win+Up arrow : Maximize the active desktop window. Win+Shift +Up arrow : Maximize the active desktop window and keep the current width. Ctrl+Up arrow : Show the previous paragraph. Alt +Up arrow : Advance up one level in File Explorer. Ctrl+Shift +Up arrow : Select a block of text. Win+Down arrow : Minimize the active desktop window. Win+Shift +Down arrow : Minimize the active desktop window and keep the current width. Ctrl+Down arrow : Advance to the next paragraph. Ctrl+Shift +Down arrow : Select a block of text. F1 : Display Help if available. Win+F1 : Launch Windows Help and Support. F2 : Rename the selected item. F3 : Search for a file or folder. F4 : Display items in the active list (works only for desktop apps). Ctrl+F4 : Close the active document. Alt +F4 : Close the active item or app. Tip: When you’re ready to shut down your computer, use Windows+I and then click or tap the Power button, found on the bottom right. You’ll find that many of the traditional shortcuts you’ve always used still exist, such as Windows+L to lock and Windows+P to project to another display.